These pictures were taken a few weeks ago when we were in NYC. Being a mom, I always enjoy the kisses and hugs from my kids. I truly cherish those special moments. Yes, I’m definitely addicted to snuggling with them, I’m sure they are, too. Here was candid photo, a sweet kiss from my lovely big girl. Anyway, back to the fashion, I’ve received countless compliments every time I’ve worn this Hanna Bernard lucky cat necklace which I special ordered from HB team months ago. Finally, I had it. Yet, I’m deeply in love with it. 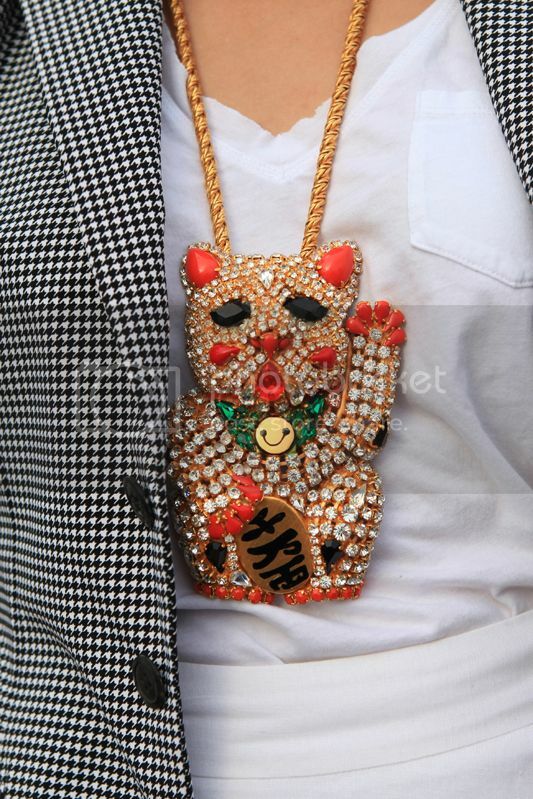 I’m so glad that I came up with this custom made cat necklace idea, my Japanese lucky cat is my treasure. And the work of HB team is always impressive. Wearing: Madewell tee, Banana Republic linen skirt, Junya Watanabe jacket, Hermes leather bracelet, sunglasses were bought on the street in Barcelona . aww as always very beautiful family. Thank you darling! You're so sweet! You deserve all the compliments you get because that necklace is out of this world! I lovelovelove it. Per usual, great photos. Your daughters are adorable. You are so lovely together! I adore those "Mother and Daughter Moments." Ooooo, perfect moments with girls! lovely! You and the kids look lovely !! This is a very very sweet post and I love the necklace. sweeeet outfit and love the necklace a lot!!! NEKO NECKLACE <3 And the electric glasses! 😀 Nice. Really love your pictures! Good luck in life. Lovely family.You are looking a very good Mom and kids look lovely.